Outage numbers continue to fall, now totaling 631 customers. This means more than 98 percent of the peak outage has been restored and crews are on target to have nearly all outages resolved by 11:59 p.m. tonight. Remaining outages will be more time-intensive and involve individual repairs. Please view our outage map for the latest numbers through the night. We will post the next outage update early Tuesday morning. Outages are down to 1,179, from a peak of 52,000 Sunday afternoon. Today’s work has been more time-intensive, involving many individual repair efforts. But our crews will not let up until power is back for all. We are still working toward a goal of 99 percent restoration by midnight. This event is tied for the eighth worst weather event, in terms of power outages, on record for OPPD. In fact, it has bumped the infamous tornado of 1975, with 35,000 outages, out of the top 10. Sunday’s snowfall on its own wouldn’t have been such a big deal later in the season. But its weight on tree limbs still full of leaves proved to be too much. As branches broke, they fell into power lines. And those who lost power know all too well the impact that had on our system. As our crews have made progress, we have continued to receive new outage reports. We want to remind customers to report service disruptions, if they have not already done so. You can report outages online or by calling 1-800-554-6773. 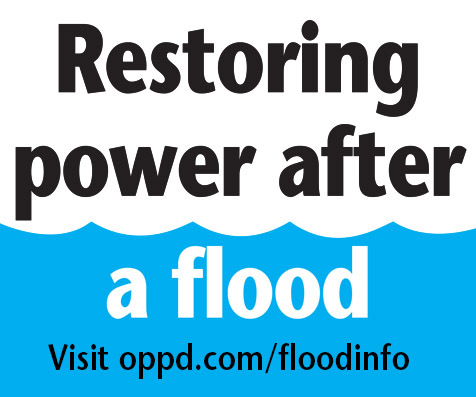 OPPD has a staff of 149 working to make repairs, as well as 60 members of forestry crews, and 28 members of wire down crews. In addition, we’ve had help addressing all outages in our service territory, with mutual aid coming from NPPD, LE Myer, Fremont Utilities and Loup Public Power. We will continue to post updates here as we receive them from our crews in the field. Crews have sent out an updated number of 2,128 outages currently from the Sunday snow storm. Crews have reported there are still reports of new incidents coming in but not at a very high rate. The latest outage number means that 96 percent of those who lost power from a storm that was at 52,000 outages at its peak have been restored. That number ties the Sunday storm with the eighth-worst in terms of overall outages in OPPD’s history. There are now 560 incidents impacting those remaining customers which are being worked on by OPPD crews along with mutual aid crews sent from neighboring Nebraska utilities. The team of OPPD and mutual aid line workers have restored all but 2,710 outages that resulted form Sunday’s early snow storm. This means 95 percent of the outages from the original peak of 52,000 outages yesterday afternoon have been restored. The remaining customers are on 590 incidents. Two of the incidents have more than 100 customers connected to the respective outages. The others have fewer or single customers, but the 149 workers are tackling them as quickly and safely as possible. In addition to 149 line workers from OPPD, Nebraska Public Power sent 12; LE Myers, 7; Fremont Utilities, 6; and Loup Public Power, 12. OPPD also has 28 specifically working on downed wires and 60 forestry crews handling the tree issues. As noted, this team continues to work safely on the tasks at hand, and OPPD appreciates the commitment. The majority of the customers should be restored by 11:59 p.m. tonight. The latest outage numbers for the wet, heavy snowfall that was dumped on the Omaha metro area has fallen to 4,030 customers without power, down from the peak number of 52,000 yesterday afternoon. Crews will continue working to restore power for those still out and have now restored power to approximately 92 percent of Sunday’s peak number. Crews continue tackling the more time-consuming restoration work around the area. 7 a.m. OPPD crews have more progress to report, with outage numbers now down to 4,548 or 91 percent of those reported due to yesterday’s storm. Of those, about 1,000 are associated with two circuit lockouts where crews are working diligently to get lines restored and power back on. As noted earlier this morning, the peak number of outages yesterday was 52,000. That number was adjusted from 57,000 that we reported yesterday afternoon, due to some data errors that have been corrected. Our priority yesterday was getting crews in and assigning them work. Once crews were out working, personnel reviewed the data. We’ve had a few new outages reported today. Two additional circuits have been restored, bringing the outage numbers down to 5,668. Additional crews will join the effort this morning, and work through the day. Overnight work by OPPD and mutual aid crews has cut outage numbers to 6,876, or 87 percent from the original peak of 52,000. That peak outage number has been adjusted from 57,000 that we reported yesterday afternoon, due to some data errors that have been corrected. Work at times overnight was slow due to a considerable amount of branches that needed to be moved, but all work has been done safely. The 101 OPPD employees have been assisted by NPPD and LE Myers crews, and additional help from NPPD, Loup Public Power District and Fremont Utilities will join the effort this morning, along with additional OPPD wire down crews. As planned, crews first worked to restore circuits, which bring larger numbers of customers back online. Crews are working on these remaining circuits. One of these circuits should be back online by 7 a.m. if work goes as planned. It runs from Shirley to C streets and 120th to 132nd streets (1,318 customers). Another circuit, bound by Underwood Ave. to Woolworth Street and 62nd to 74th streets (143 customers), will take a bit longer, as there is a considerable amount of tree trimming still to be done. Crews are working on another circuit outage impacting customers from Jones to Wright streets and 26th to Turner Blvd. (891 customers); however, we don’t have an estimated restoration time yet. Once all circuits are restored, progress is going to slow as crews begin to focus on the many pockets of individual outages. Crews will continue to work throughout the day, and daylight will be a welcomed sight. Overnight work by OPPD and mutual aid crews has cut outage numbers to 9,110, or about 82 percent of the original peak of 52,000. That peak outage number has been adjusted from 57,000 that we reported yesterday afternoon, due to some data errors that have been corrected. As planned, crews first worked to restore circuits, which bring larger numbers of customers back online. Once all circuits are restored, progress is going to slow as crews begin to focus on the many pockets of individual outages. OPPD hopes to restore power to 99 percent of customers late Monday, by midnight, barring any unforeseen complications. Outages are down to approximately 18,000 customers at this time. Restoration work will continue through overnight hours, to try and restore all circuits by morning. More time-intensive repairs will be needed to bring the remaining customers back online. OPPD hopes to restore power to 99 percent of customers late Monday, by midnight, barring any unforeseen complications. Restoration work over the past hour has involved more time-intensive repairs, with 24,486 customers still in the dark at this time. This is down from 57,000 this afternoon. Work will continue through the night, with hopes of restoring all circuits by morning. However, more work will remain to bring back smaller batches of customers impacted by more localized issues. OPPD aims to have power restored to 99 percent of customers late Monday, by midnight, barring any unforeseen complications. OPPD has more than 100 workers out in the field working to bring back power, plus support staff behind the scenes. In addition, NPPD, Loup Public Power District, and LE Myer have provided crews to support our restoration efforts. Fremont Department of Utilities is sending a crew, as well. 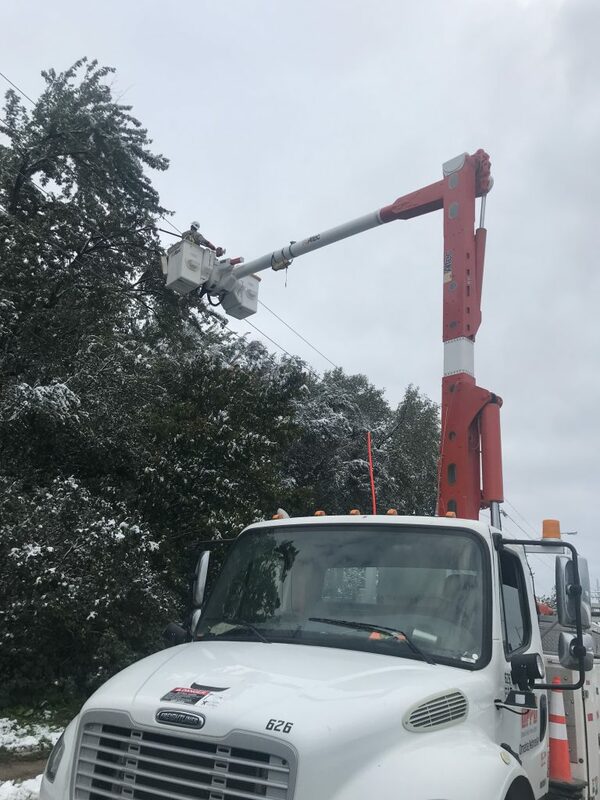 Snowfall on leaf-covered trees caused branches to snap throughout our service territory, falling into power lines and equipment, much like the October ’97 storm. Douglas County was hit the hardest. 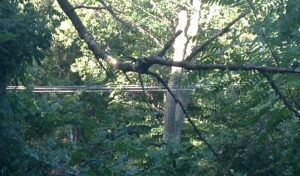 Our forestry team at OPPD, including utility foresters and contractors, works hard to reduce tree interference with power lines. However, these extensive maintenance and planning efforts cannot prevent all disruptions, especially the kind we’ve seen today due to such an unusual early snowfall event. Areas that are served by underground distribution – mostly neighborhoods west of I-680 –can also be impacted by tree interference with power lines. That’s because these areas are often fed by overhead lines running along major thoroughfares in the city. We know it’s hard for those coping with extended power outages. Rest assured, our crews will not let up. Tree trimmers, line techs and support staff will keep working this evening, through the overnight and beyond until power is back for all. Please continue to check our outage map for the latest outage numbers. If you experience a new outage, please be sure to report it online or by calling 1-800-554-6773 . Outages are down to about 25,000 at this time, as OPPD crews continue their relentless work to restore power to those impacted by today’s weather. At one point this afternoon, 57,000 customers were without power. Our team continues to work hard to restore power to customers, and we are getting mutual aid support from Nebraska Public Power District. Crews hope to have all circuit lockouts restored by morning, which should bring power back to the majority of customers. But lengthier repairs will be needed to bring power back to all. OPPD aims to have power restored to 99 percent of customers late Monday, by midnight, barring any unforeseen complications. OPPD crews are putting a good dent in the number of outages in our service territory caused by today’s early snowfall. Currently, more than *31,000 customers remain without power. This is down from nearly 57,000 outages reported mid-afternoon. We hope to have most circuit lockouts restored by morning. Crews will continue to work throughout the day and evening, Monday, to restore power to the remaining customers. They hope to have 99 percent of those outages restored by midnight tomorrow. OPPD has 18 tree crews working to clear tree limbs from power lines and trim back other branches that threaten electrical service. We also have nearly 100 crews working on troubleshooting and repairs in order to restore power as quickly as is safely possible, given these conditions. Today’s snow-related outage event is reminiscent of the infamous October storm of 1997, although, thankfully, not as dramatic. That storm caused three times the number of outages we’ve seen today. 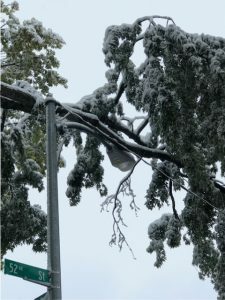 Both were the result of heavy snowfall on leaf-covered trees, which snapped branches and wreaked havoc with power lines. We will continue to post updates this evening as we receive more information from our storm team. The snow that blanketed the Omaha metro area Sunday has started to melt and fall off trees, a pleasant sight for power restoration efforts. At this time, 41,179 customers remain without power. Nearly 100 OPPD personnel are working in the field assessing damage and making repairs. We can estimate that 99 percent of the outages will be restored by midnight Monday (10/15), with most circuit lockouts estimated to be restored by Monday morning. These estimations are subject to change, however, if damage is more extensive. We’re seeing progress on outage restoration following Sunday’s snow showers. A total of 45,606 customers remain without power, down from a high of 56,000 earlier this afternoon. Customers may encounter downed tree limbs and potentially downed wires. If you do, DO NOT APPROACH DOWNED WIRES. Always assume they are still energized and avoid the area until the situation is addressed by OPPD. Below, an OPPD crew works in the Millard area. Outage numbers continue to fall following the area’s first snow of the season – 51,240 customers remain without power. Approximately 80 OPPD personnel (including crews and troubleshooters) and 18 tree trimmers are in the field assessing damage and making needed repairs to bring customers back online. 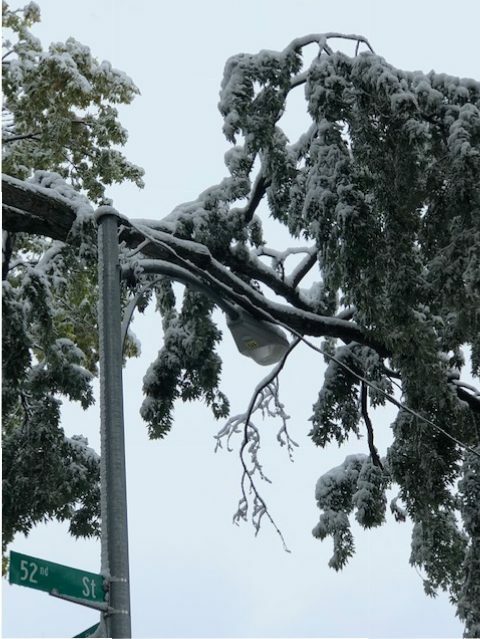 Preliminary reports are that the combination of wet snow and leaves on tree branches was the main cause of outages Sunday when the weight of the snow caused branches to sag into lines. The snow has stopped and outage numbers are beginning to fall as crews assess the damage from the area’s first snow of the season. At this time, 54,332 customers remain without power, down from a high of more than 56,000. The combination of snow and leaves on branches can add considerable weight to trees, which may then break or fall into overhead power lines. Areas that are served by underground distribution – mostly neighborhoods west of I-680 –can also be impacted. These areas are often fed by overhead lines running along major thoroughfares in the city. When these lines are impacted, it can cause an outage to underground systems. Below are some photos from the area around 52nd and 54th Street and Spring Street. Snow continues to fall in the Omaha metro, and outage numbers have increased to 51,562 customers. Troubleshooters and crews are beginning to assess damage from snow-laden tree limbs and other outage causes. We are unable to provide an estimated restoration time until damage and necessary repairs can be assessed. Below are some photos from the area near 60th Street and I-80. Outages are continuing to increase as wet snow falls onto branches, impacting power lines. Widespread outages are affecting 42,827 customers at this time. A total of 17 circuits are currently locked out. OPPD’s service centers are opening to bring in more crews to address the outages. When wet snow falls onto branches with leaves, it can quickly drag branches down onto power lines. If you encounter a downed power line, DO NOT APPROACH. 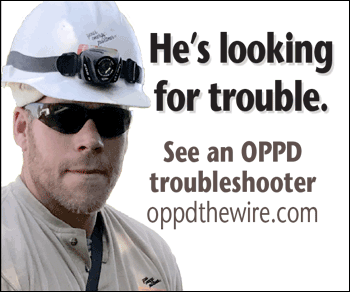 You should assume all downed lines are still energized. Outages are increasing as wet snow fall across the Omaha metro. At this time, 26,570 customers are without power. There are currently eight circuits out and additional troubleshooters and crews are being called in as needed. Some traffic lights in major intersections are not working due to the outages. If you approach one of these intersections, treat it as a four-way stop. 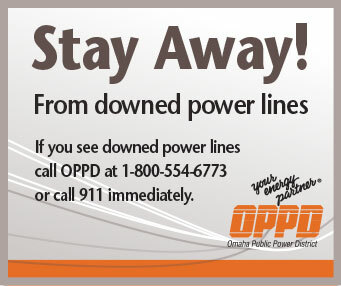 And if you encounter downed power lines, DO NOT APPROACH THEM. 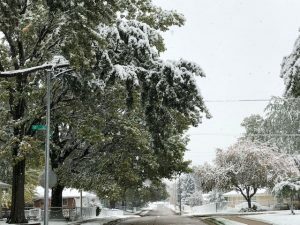 Wet snow combined with tree limbs that still hold leaves are contributing to power outages in the Omaha metro area today. At this time, 12,966 customers are without power. The season’s first snowfall has come steadily all day and is not forecast to end until this evening. A number of circuits are locked out at this time and additional crews are being called in to respond to outages. 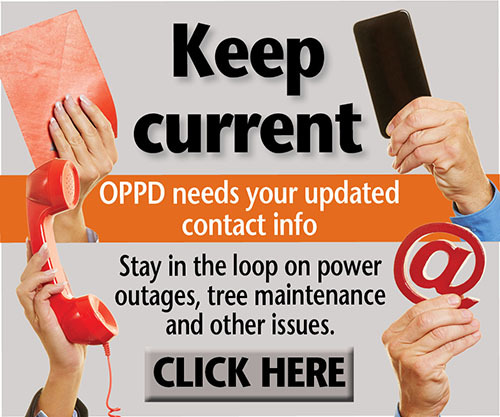 If you experience an outage, please contact OPPD by phone (1-800-554-6773 ), online or via our mobile app so we know your area and can respond accordingly. Sunday, Oct. 14, 11:45 a.m. Snow has been steadily falling across the Omaha metro area Sunday, with accumulation being seen on grass and trees. At this time, six circuits are affected with 5,281 customers without power. Additional crews have been called in to respond to the outages. If you experience an outage, report it online, via the mobile app or call 1-800-554-6773 . Paula Lukowski has more than 35 years of experience in corporate communications, 28 of them at OPPD.